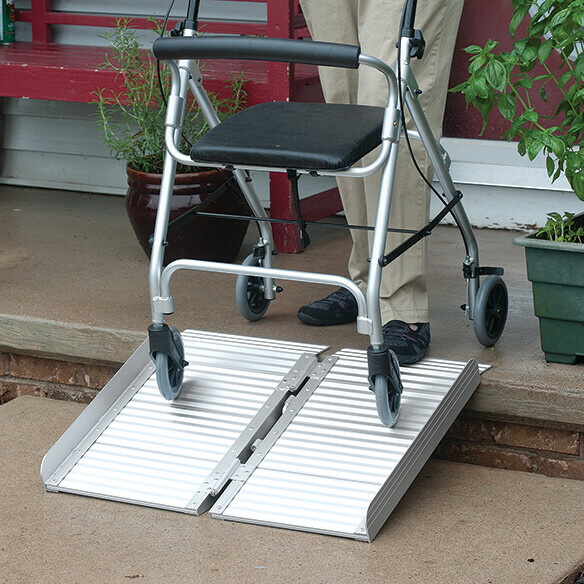 Tackle life’s ups and downs with a 24" portable ramp that helps you stay independent. Folding design provides an incline to help maneuver over uneven surfaces smoothly. Perfect for crossing curbs, low stairs, porches and thresholds, van side doors and much more. 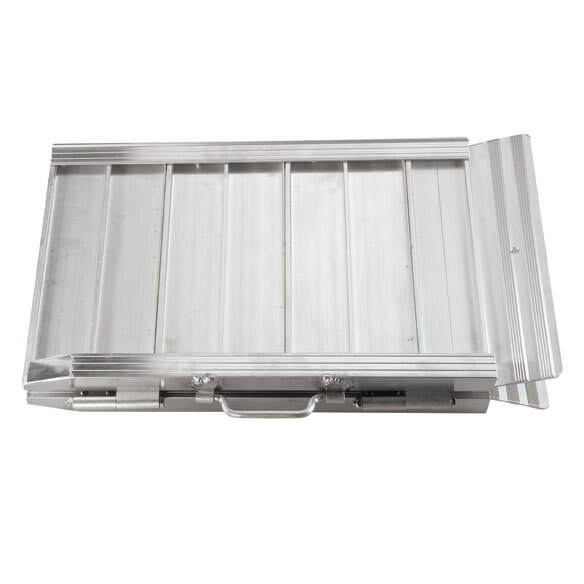 Lightweight aluminum ramp with built-in handle folds flat, so you can take it along for anytime use. 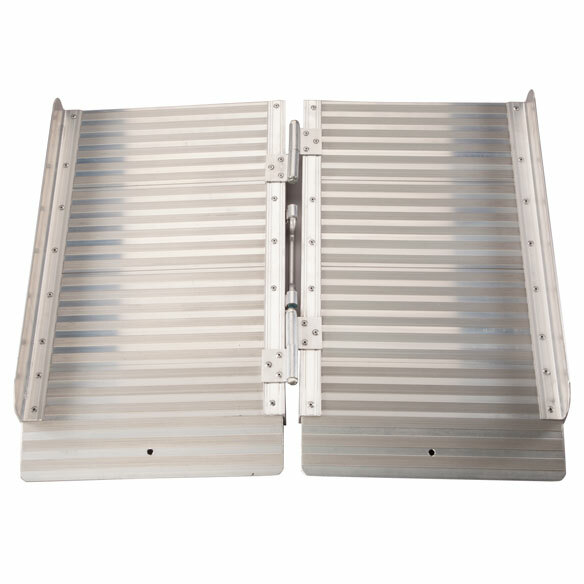 Threshold ramp is portable and lightweight for easy transport. High-traction, solid surface for non-slip security. Portable ramp weighs just 12 1/2 lbs. yet supports up to 600 lbs. Durable construction with no assembly required. 24”L x 28”W x 3”H open; 24”L x 14 1/2”W x 4 1/2”H folded. I just received this ramp and it is going right back for a refund. There is no safe way to attach this ramp to the doorway. They forgot to add a lip area to rest against the opening so the ramps easily slip away from the door frame when pulling up a wheelchair onto the ramp. The underneath also has an area with poorly cut metal with sharp edges. I have no idea who designed this ramp but it is clearly defective and unusable for the stated purpose. My mother's sunroom has a step down. This will make it easier for her to get walker down without having to lift the walker. I use a wheelchair and the world used stairs. to help get friend out of house easier. Need to go over threshold with wheel chair. to help my grandson to get in my house. I have a patio that is about 4 inches higher than the deck that I have to traverse to get into the house. It's been an ordeal (for years!) getting carts up and down that ledge. Hope this helps! Needed for transporting wheelchair out of home. Light and portable. 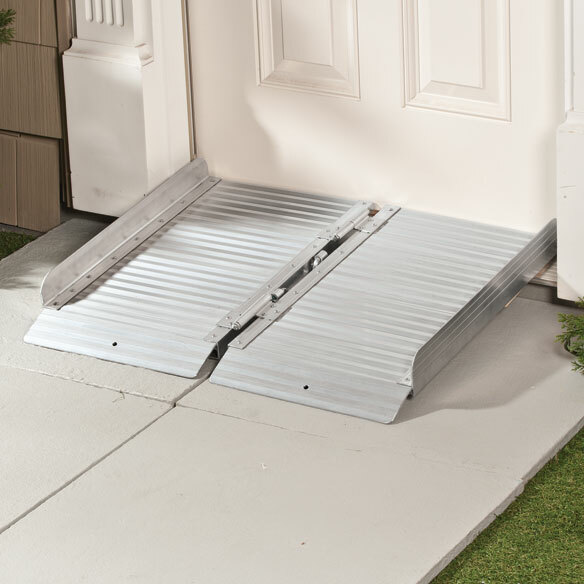 Great for trying to get a wheelchair over that one step in or out of a house. The weight capacity, and width, and convienience. Need to get my wheelchair to go inside my brothers house. after looking this seemed like a good deal. can ramp go over one porch step about 8" high? t high? BEST ANSWER: Thank you for your question. The ramp will be able to work with one step. We hope this information will be of help to you. with 2 poor reviews for wheelchairs, how will it work with my walker?